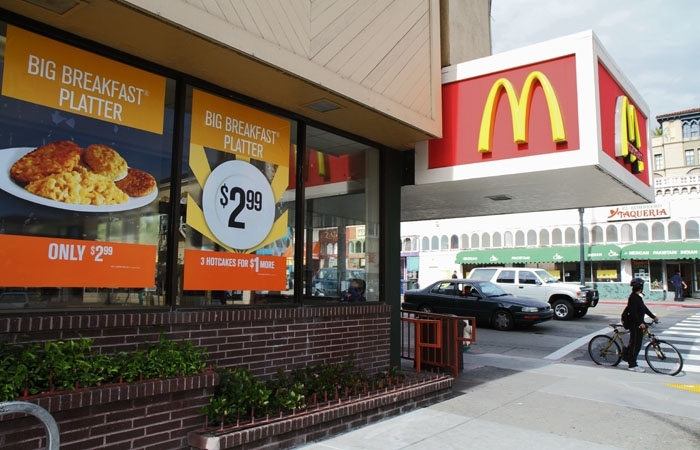 McDonald's on Shattuck Avenue and University Avenue participated in National Hiring Day. Hundreds of job seekers filed into Berkeley's two McDonald's locations Tuesday to apply to the fast food giant's workforce during "National Hiring Day." Across the country, thousands of applicants showed up at McDonald's restaurants in the hopes of filling the 50,000 open "McJob" positions, giving them a chance to find jobs amidst high unemployment rates nationwide. McDonald's spokesperson Ashlee Yingling said in an email the event was part of an effort by the corporation to play a part in the national economic climate by "helping to fuel economic growth and recovery" by offering more job opportunities. National Hiring Day garnered a great deal of media attention as many national news organizations pointed to McDonald's as providing possible employment opportunities for those drowning in the current economic climate. With the national unemployment rate at 9.2 percent, the prospect of 50,000 open jobs piqued national interest, according to the U.S. Bureau of Labor Statistics. Applicants arrived at the restaurant on Shattuck Avenue as early as 7:15 a.m. to turn in resumes and fill out employment forms, according to Reyna Alejandre, shift manager at the location. A total of about 50 people turned in applications, according to Alejandre and Troy McConico, another shift manager. Alejandre said the manager was looking to hire about 25 employees at the Shattuck location. McConico said he was "surprised" at the demographics of the applicants. "It was like every walk of life came through," he said. Alejandre said she received an application from a 17-year-old student as well as a 45-year-old man seeking a managerial position within a few hours of one another. Similarly, the applicants at the other Berkeley location on San Pablo Avenue seemed to come from a wide variety of backgrounds, according to Mona Chen, the shift manager at that branch. The San Pablo location saw much more foot traffic, as about 200 job seekers filed in to fill out applications, according to Chen. Throughout the day, applicants looked at brochures and applied for both crew and management positions. Crew positions make $8 an hour according to the McDonald's website, while managers earn a higher wage - the exact amount depending on their amount of experience. Those who applied for positions on Tuesday should receive calls within a week and then must go through an interview round before being chosen to join the McDonald's team, according to Alejandre.